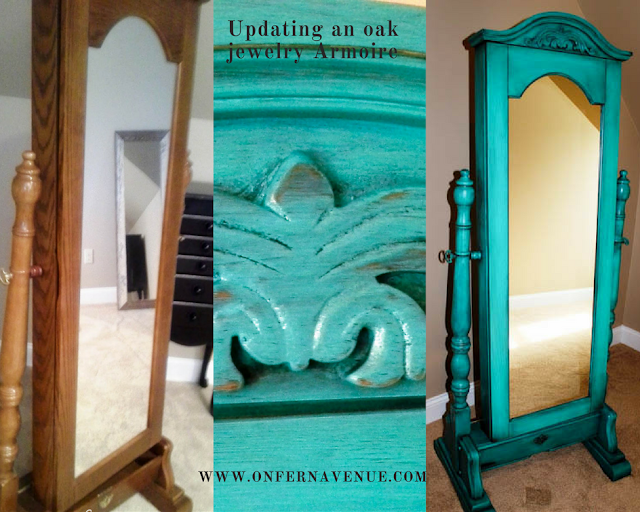 I am sure you by now know how much I enjoy hitting up auctions or estate sales to find goodies to give a makeover. I went to an auction and laid my eyes on this beautiful jewelry armoire. 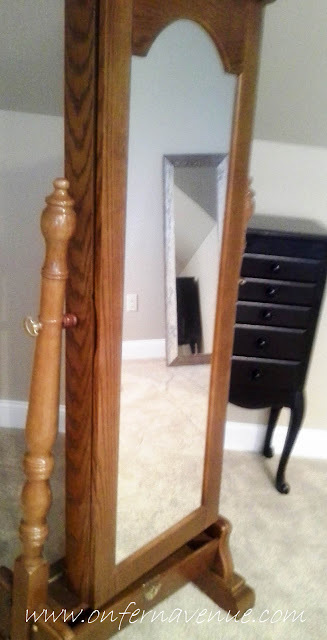 To some it probably doesn't look like much, and honestly I walked away paying very little for it because most at the auction didn't see what I saw with this lovely full size jewelry armoire. You see I love jewelry, and I've always wanted a storage that had a mirror so I could see how it looks with my outfits. Sadly so..most of my outfits these days are made of paint covered clothing, but on those days that I do get to dress up...well I have a full length mirror on a jewelry armoire. That's a win for me! I loaded it my van & headed home with big dreams of turning this into an aqua beauty.. Oh yes that's right I would be giving it a nice new look of aqua clothing! My favorite color. I had been eyeing this color from the Maison Blanche line called Colette. It's so smooth & beautiful! I ordered my color & patiently (ha ha..if you know me, patiently + Lynn...nope not really) waited for my Colette to arrive. And, when it did there was the sweetest note. YAY! Now to get to work on bringing this not so pretty jewelry armoire to life! The first thing I did was give it light sanding. And, then I cleaned it well making sure it was free of any dust or any other dirt! I gave it a nice first coat of Colette and, let it dry (the paint dries fairly quickly). I used a sanding sponge for in between coats. The paint goes on buttery smooth!! I hit it off with another coat of paint... let it dry and gave it a light sand with my sanding sponge. Let it dry completely. 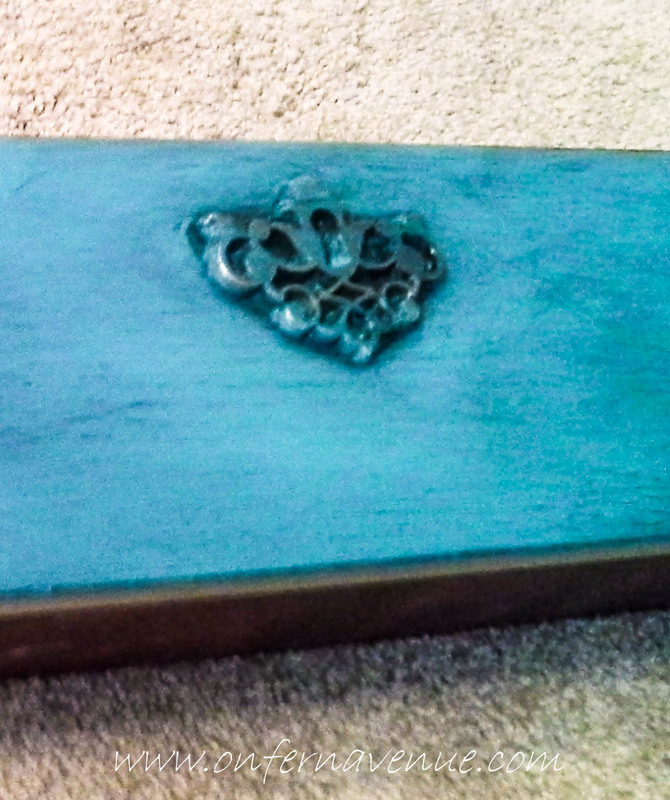 I sanded any areas that I wanted to add a distressed spot, mainly around edges & the details. You want it to look natural. I then took some dark stain, Kona, to create an aging look (glaze). Kona is a very dark brown almost black stain. Brush on stain very light in stages. Basically I would work in about a 4-6 inch area at a time. You can see here how it sits inside the details of the armoire. I applied stain in the area and then using baby oil rubbed it down with the oil (you can use any oil like olive oil, grape seed oil, veggie oil). I put the oil on paper towels or old white t shirts. The oil moves the stain around so it's not one big dark spot of stain. 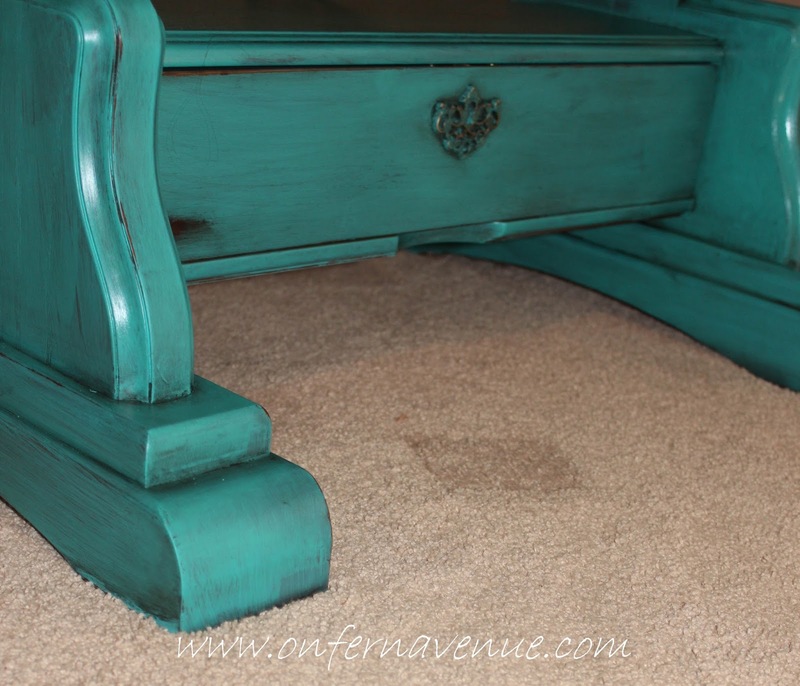 The oil gives you time to work the stain into the areas you'd like to have it. Once I had completed the stain on the entire piece, I went back & added desired aging/distressed spots where I thought looked good (i.e. the corners, in nooks/crannies, etc). I took an artist brush to get it inside the corners, or in the tight spots. I then use a clean towel and wipe it down helping to wipe any excess oil off. You can also use rub'n'buff and do the same thing with oil. I did use a little of the Spanish Copper to give a little added age look. With this I only used a tiny bit around the corners(it only takes a small amount of this stuff). I let the oil dry and then I buff it, and then I hit this one off with a little clear wax. It turned out just exactly how I imagined... beautifully aged painted the most lucious aqua. She stands tall & proud in my room holding some of my most precious jewelry! So with a little paint you can easily take something that is old, worn and dated to new, fresh & up to date. Easy peasy! Thank you. I love it & the way it turned out. Beautiful makeover, I love the color. Hi Lynn! It's Angela from twelveoaksmanor! This is awesome!! Great job!!! I found you over @ Debbiedoos FB page - great post! I am a new follower! Hi! It is Colette from the Maison Blanche paint line. I added stain to darken it & antique it. It is a beautiful color. Thanks for visiting. That color is so delicious! I want to touch it and I bet it feels like silk!!!! It's very vibrant and really Stunning. I'm sure it's even more beautiful in person. I just saw a jewelry box/ mirror recently at a consignment shop. It was excatly like yours (before pic because the makeover was not even close to what you did) that had been redone and distressed with a darker color, more bluish toned and it was going for $399.00 and yours is 100xs more detailed, glamorous and really standouts because that color is dreamy....but items like this, hope chests, hutches, vintage armoires, that are flipped or redone for a vintage, shabby chic, French influenced, AND the color you chose and how you distressed it.... They go for so much around here in New England, Connecticut specifically speaking. The farm house vintage distressed French shabby chic decor is huge right now and people have stupid money to spend on things to achieve this look. Very beautiful and I want that color!!! Thank you Jessica for your kind words. I know I've always wanted one of these armoires & they're always way more than I ever want to spend. I was so lucky the night I scored this at the auction. Wow! This is an absolutely gorgeous makeover! That color is so vibrant... I love it! 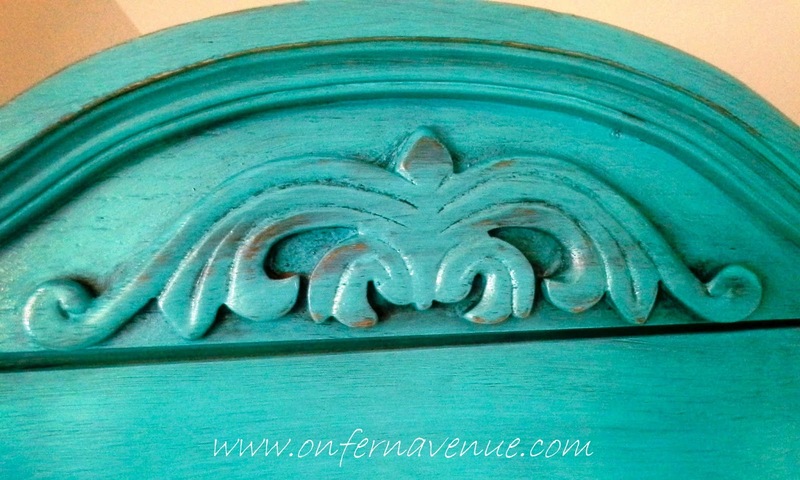 Thanks for sharing your furniture makeover with us at Merry Monday this week! Oh my goodness, that turned out so beautiful! 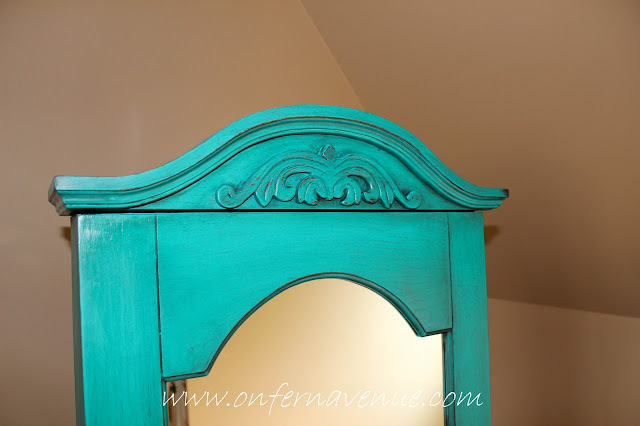 I never would have guessed that old armoire would look so good. Great job! Thank you for linking up at the #HomeMattersParty this week! Gorgeous! 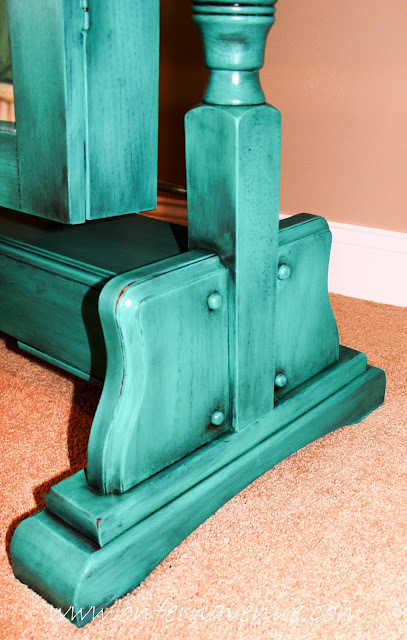 I love this color of blue, and how you aged/distressed this. I'm doing a few pieces for my own home, and I really appreciate the tips you're giving here, especially about using the baby oil. Visiting from Feathered Nest Friday. . .